Trying to juggle complex theories of metaphysics and cosmology with simple themes of self-acceptance and the deterioration of the “darkness,” A Wrinkle in Time comes off as a disjointed and miscalculated project, rather than a visual and contemplative journey. Madeleine L’Engle’s novel, which Ava DuVernay’s A Wrinkle in Time is based upon, came out in 1962, well over fifty years ago. When Disney announced that they would be bringing this story to life once again (they produced a TV movie in 2003, which L’Engle detested), the studio’s reputation along with the quantum leaps the industry has made in visual effects since even the early 2000s made it seem possible that L’Engle’s intricate and inventive words could actually coincide with a big screen production. To DuVernay’s credit, A Wrinkle in Time is flooded with images of imaginative prowess. However, the majesty of these creations distract viewers from more than they enhance the cosmological adventure. And though its source material presented certain kinds of complicated theories and themes, Wrinkle fails in re-offering those complex thoughts in the comprehensible and entertaining light the children’s book did fifty years ago. Young audiences will certainly be dazzled by the bright colors and the various CGI makings integrated into them, but that will more than likely be where their attention remains. The story follows 13-year-old Meg (Storm Reid). Once a gifted student and lively young lady, her motivation and personality deflated almost entirely after the mysterious disappearance of her astrophysicist father (Chris Pine). She’s a misfit. Living in an unrealistically hostile environment, her classmates leave notes on her locker wishing she had disappeared too, and her teachers have no problem simplifying the issue and telling her to get over it. The exception to Meg’s cruise-control approach to life is her relationship with her five-year-old brother, Charles Wallace (Deric McCabe), a genius who uses words like “diplomacy” in regular conversation – the combination of his cute demeanor and extensive knowledge was surely designed to guide the young children watching and keep them in the loop once the sci-fi aspect kicks in. Meg’s father, a NASA scientist, vanished just as he had discovered a way of extensively traveling through space via a “tesseract.” His presentation and proposal are met with rolling eyes and jeers brought upon by a seemingly ridiculous idea. However, a visit one day from Mrs. Whatsit (Reese Witherspoon), an interstellar traveler, to Meg and Charles Wallace changes everything and finally offers some sort of answer to the family’s puzzling tragedy. She tells them that the tesseract is real, and that their father is trapped deep within the universe; he has traveled farther into space than any man could even dream. With Charles Wallace, and her easily could-be boyfriend, Calvin (Levi Miller), whose selfless dedication to his friends is admittingly far greater than my own, Meg accompanies Mrs. Whatsit and her fellow intergalactic beings, Mrs. Who (Mindy Kaling) and Mrs. Which (a literally larger-than-life Oprah Winfrey), on a journey across the universe to find her father. DuVernay’s imagining of the tesseract is incredible; the worlds wave, bend and topple over as our adventurers prepare for their numerous exits. It’s this kind of surreal viewing experience that formed Wrinkle’s potential. The best of the places the characters visit throughout the film are, however, the ones shot on location. Yes, it’s easy to decipher which were filmed on soil and which were created by a green screen. In fact, it’s too easy to decipher, causing those aforementioned distractions. One meadow-esque planet features floating flowers who speak color, and hovering mountains of Avatar influence. The loveliness that resides here feels genuine, and though there are things like the chatty flowers that are digitally inserted into the landscape, DuVernay’s way of filming places like these makes them so beautiful that it’s hard to believe that we’re actually seeing something real. Though there are faint hints of him everywhere they go (no matter where they are, and though he disappeared four years ago, it seems like the three always just missed him), Meg’s father is not in one of these convenient places. He’s trapped in what Mrs. Which calls “the darkness,” which, though it resides in the realms of space, fuels much of the hatred and misery on Earth. “The only thing that travels faster than light,” Mrs. Which explains, “is darkness,” and with four years of torment under her belt and a fractured support system, Meg certainly has some darkness in her. What’s interesting is that it affects her abilities in the extended universe and the group’s mission, especially once the three beings drop Meg, Charles Wallace, and Calvin off in the darkness to fend for themselves. The way for Meg to reach her full potential is, of course (Disney…), to accept who she is. This is certainly not a bad message to send, but in a film where it’s suggested that your mind can literally bend space and allow you to travel millions of lightyears almost instantly, it feels pretty simplistic. As a result of it being not only the more grounded but also the central theme of the plot, it becomes difficult to take the scientific hypothesizes seriously; and given that the entirety of the movie’s journey is based on these hypothesizes, this certainly doesn’t help audiences take the film seriously. See the problem here? 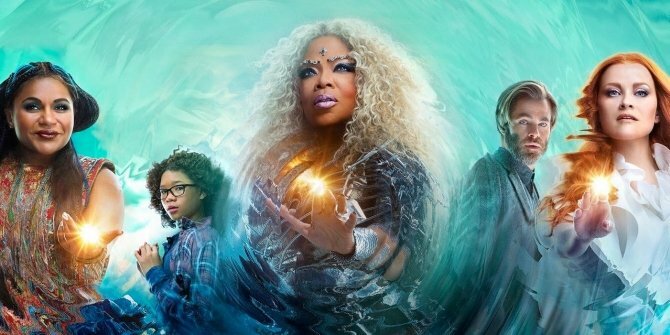 The wonderful trends the filmmaking process will hopefully set do not, however, save A Wrinkle in Time from its rather loose hold of the themes, and its hackneyed usage of CGI. By bringing this wholly creative story to life from the page, DuVernay spends too much time and effort visualizing and realizing the limitless worlds L’Engle had written, and thus takes away from the book’s greatest attribute: our chance to imagine.